A new post again and it's a Mango Ice Cream ! I had shared this recipe some time back,but now I am updating the pictures. Summer is here and so do Mangoes.Who doesn't love Mangoes? As this fruit is available only during summer time and vanishes in few months, I try to make most of it and enjoy. 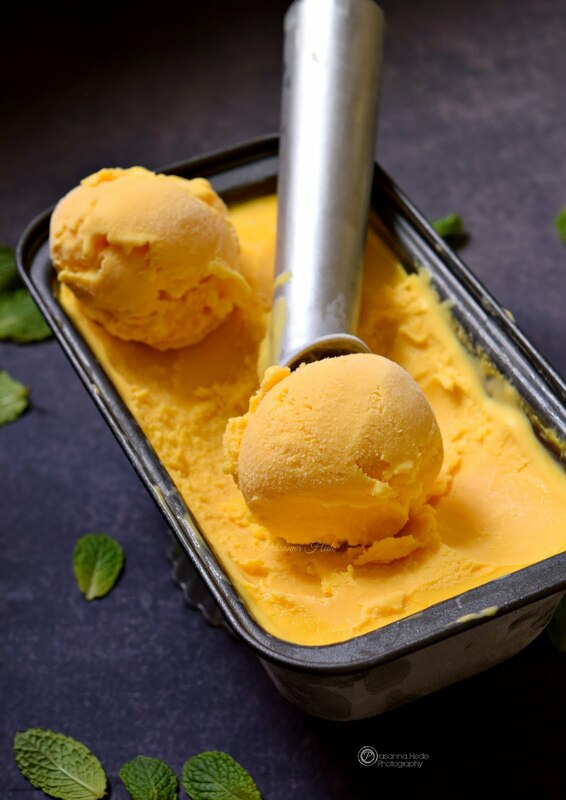 Here I am sharing most delicious and easy Mango Ice Cream you can make. During Summer,making variety of ice cream's at home is something I love to do. These days I completely stopped buying ice creams unless and untill its something that I am missing badly and can't wait long to make. I have shared before my recipes of various icecreams: Coffee Ice Cream, Mango Popsicles, Strawberry Lassi Popsicles, Almond Kulfi, Pistachio Kulfi. Do check these out. There are lot of Mango recipes that I have shared too: Mango Cupcakes, Mango Jam. I have this habit of storing Mango Pulp in refrigerator for emergencies when I crave to have Mango Icecream/Milkshake/any dessert and there are no mangoes in the market. So buying a store bought mango pulp works but it works best when you have pulp of mangoes that you love to eat. So when my favorite Mangoes are in abundance in market,I will usually make pulp and freeze them so that I can use that whenever I crave for it. This ice cream is so yummy and delicious,that you will forget that it's not store bought but made at home! In this recipe I have not whipped the cream but you can do that,till the cream has soft peaks. Separately mix together the Pulp and Condensed Milk well and later slowly add it to whipped cream. In a mixing bowl,whisk the cream till soft peaks appear. In another bowl,mix together condensed milk and mango pulp. Transfer the contents to a freezer safe bowl. Cover it with a aluminum foil and close with the lid. Freeze it for 8 hrs or till its firm and set. Scoop out the ice-cream and enjoy! 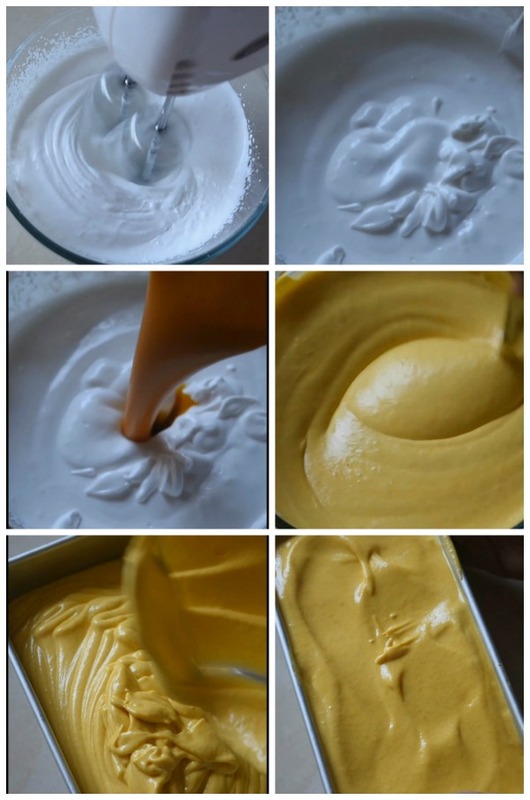 Ste by step picture of how to make NoChurn Mango IceCream! You can alternatively whip the cream till it forms soft peaks and then mix with condensed milk and pulp. No need of any ice cream maker here, so just mix well and cover. Make sure you use freezer safe bowl and scratch resistant bowl,so that its easier for scooping. Did you check out my recipe video for this recipe? Here is the link for you all to check that out. Extract pulp without adding water and freeze it. Remains good over an year! mix by hand, or use a blender? with a hand beater / whisk or spatula should work fine. I love that this is no churn and eggless, thanks so much for sharing! Mango makes my top 5 favorite fruit, that's for sure. I love mango ice cream but I have never tried making one at home. Thanks for the recipe! This icecream looks amazing! I love mango. Also love this egg free. So love no churn ice cream recipes - remind me of ice creams we would make as a child! All the heart eye emojis!!!! This is easy, it's mango, it's frozen.. honestly what else would you want?! Love this. I also love mango season! Can't wait to try this ice cream! 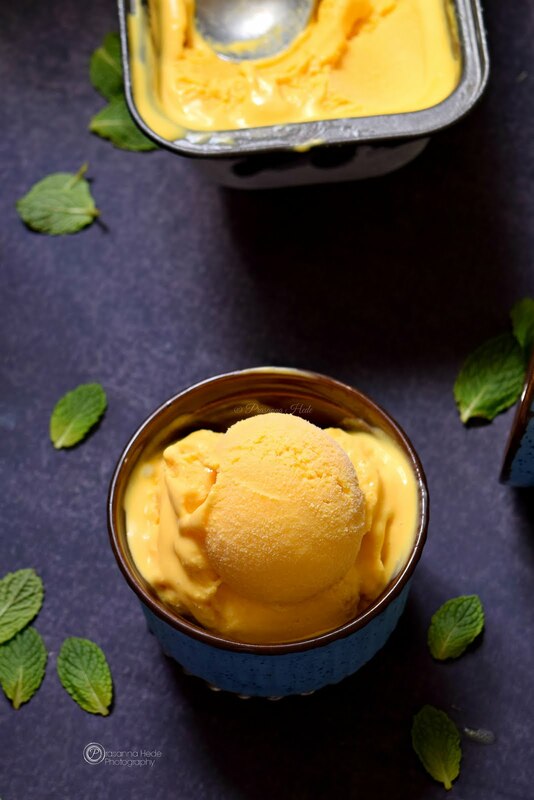 This mango ice cream looks delicious and oh so scoopable. I had never heard of mango pulp until today and now I've seen it referenced twice! 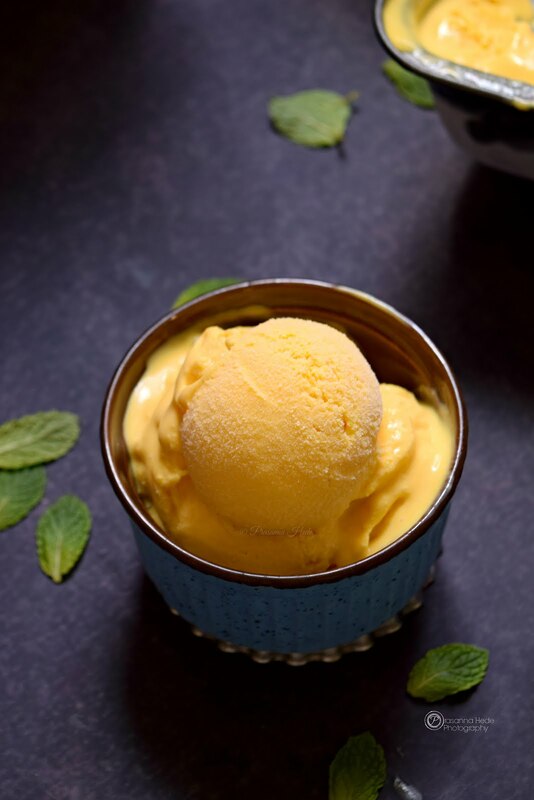 What a simple but equally delicious recipe for mango ice cream. Fuss free too with no churning! Thank you! You can try and whip the cream then, I used heavy whipping cream in this recipe so may be it was much creamier when I did. thanks for recipe, i have tried its variant quite few times, but alwyas ice cream turn ICY rather than creamy:(. In what container u store the pulp? Thank you, I store in freezer safe glass container. Try with heavy cream if you used regular cream. I tried ur recipe though I churned the mix in the ice cream maker. I also added a few drops of mango essence. It turned out great. Oh this should be such a tasty and amazing ice cream. Love, love mango ice cream and no-churn is a winner in my book. This looks really easy! Luckily I just bought a whole box of mangoes! Now if the weather would just warm up, I'd be golden. This ice cream looks like a dream! Love the fact it's a no-churn, and I can't wait to try this recipe! Perfect for the upcoming warm season! This looks creamy and delicious - I'd love to try this recipe! This looks so creamy and flavorful! Mangoes are one of my favorite fruits, especially when they're so juicy and ripe in the summertime! Mango ice cream sounds like the perfect sweet treat. 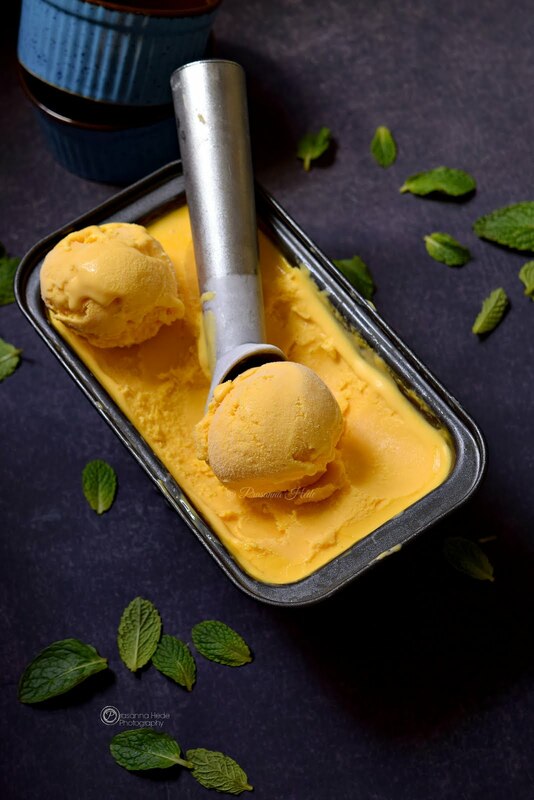 Mango ice cream is just the best, it always tastes of summer and is so much more refreshing than chocolate or vanilla. Homemade ice cream is the best! And I love the idea of mango, it sounds so refreshing! This looks so yummy! 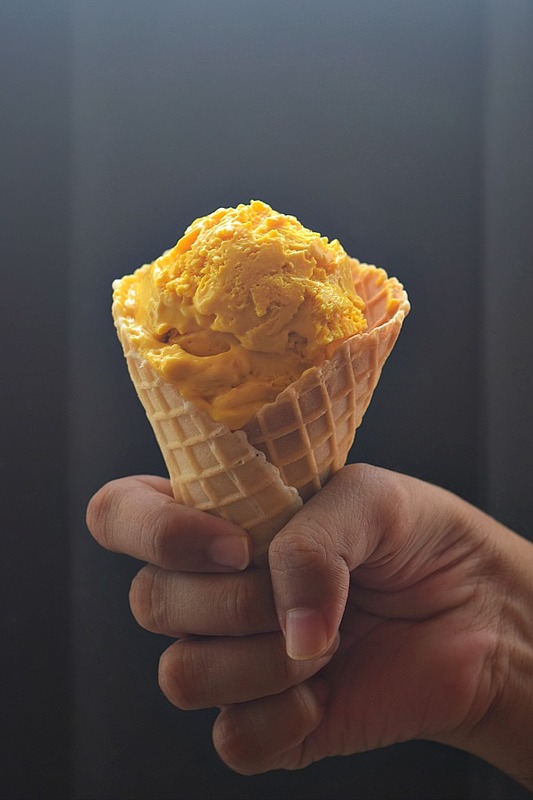 I lived in Nepal for a year when I was in high school and almost every day after school I'd get a small scoop of mango ice cream while walking home. I haven't seen anything like it anywhere in the U.S., but this look just like the ice cream I remember eating. I'm so happy! Now I can make it for myself! This mango ice cream sounds like it would be amazing when it's hot out. Definitely bookmarking this for our next heat wave. Thanks for sharing your recipe! I've been seeing tons of mangoes recently at the grocery store and would love to do more with them. This looks and sounds amazing! Love that it's a no-churn ice cream recipe so it's nice and easy! Last month I went to Mexico and had the most delicious mango ice cream at the resort. I think I spent the entire week eating this ice cream at least once a day. I've tried a few recipes since returning and can't wait to try this one with mango pulp, yum!